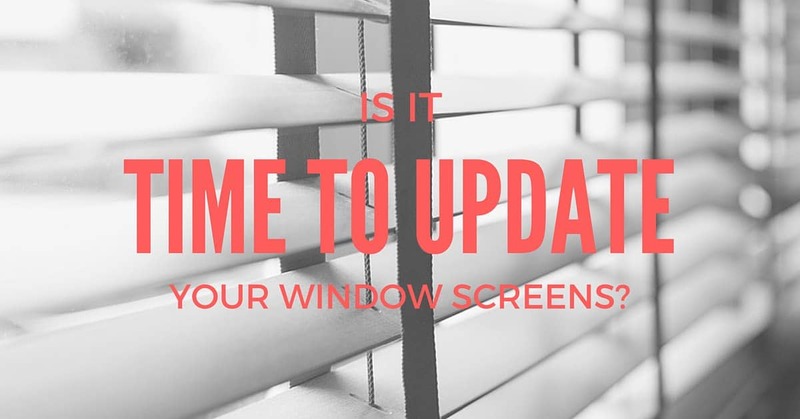 Is it Time to Update Your Window Screens? When thinking about home renovation, visions of granite countertops or kitchen backsplashes might dance through your head, however, replacing your outdated window screens might prove to be a more cost-effective and important renovation. In general, home improvements make your living space more enjoyable and increase your property value when you go to sell your home. We’ve compiled a list of some compelling questions to ask yourself when deciding if it’s time to upgrade your old outdoor screens or window coverings for quality, custom UV blocking sunscreens. Do my current screens protect my family and home? If they’re not blocking UV rays, then probably not. Protective window sunscreens use high-quality material to block 80-90% of the sun’s harmful UV rays from entering your home. Keeping UV rays out of your home keeps them off your family’s skin, as well as off your furniture, curtains, artwork and flooring. Not only do these sunscreens protect against UV rays, they also prevent almost 50% of the sun’s heat from even touching your windows – keeping your air conditioning unit and family happy. Sunscreens also protect your privacy. While preserving the beautiful view you enjoy while looking out of your windows, sunscreens block the view from the outside-in, allowing you to enjoy the view you love and the privacy you deserve. During cooler winter months, feel free to keep your windows open, and be rest assured your quality sunscreens will continue to protect against UV rays, as well as insects and other critters from entering your home. Will my current screens help sell my home (are they attractive)? Curb appeal matters, especially when selling your home. A recent investigation by the National Association of Realtors showed that window and door projects tend to pay for themselves. According to the study, homeowners can expect an 81-88% return on window upgrades at closing. Even if you are not currently selling your property, it is important that the outside of your home present a beautiful first impression. Older and less modern window screens can quickly become faded or torn – and are not only no longer functional – but also unsightly. Don’t let ugly and outdated window screens tarnish the appeal of your property. After all, you only get one chance to make a first impression. Are my current screens good for my wallet? As mentioned above, homeowners who invest in window upgrades can expect a large return-on-investment in selling their home, but did you know protective sunscreens lower your monthly expenses as well? SRP estimates that protective sunscreens lower the average user’s energy bill by about 25% per month – each and every month. Relative to other renovation projects that do not end up paying you back each month, protective sunscreens are a wonderfully cost-effective way to improve your home (and your home’s value). There are also many exciting government rebate programs for homeowners who choose to install sunscreens on their home – which means more money back in your pocket. Are my current screens made of the highest quality materials? If they’re not Textiline, then probably not. At CC Sunscreens, we work exclusively with Textilene, who are industry leaders in creating extremely durable PVC coated polyester yarn made to withstand even the most punishing solar abuse. No more faded, or torn window screens. Whether you are in the “gathering information” stage or ready to get your sunscreens installed, do not hesitate to call our friendly team at CC Sunscreens. We will answer any questions you may have, and are happy to come to your home for a free, no obligation estimate. Kick your feet up, and let CC Sunscreens take care of your next home renovation project – leaving you to enjoy your beautiful view from the comfort of your (newly) cooler home.